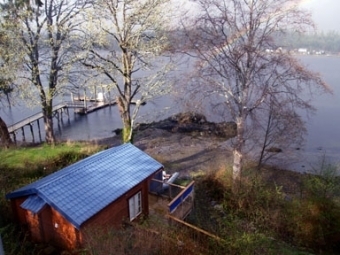 A half acre property on the Ucluelet waterfront boasts 2 cabins and a one-bedroom suite, all custom designed and tastefully decorated to give you the most relaxing and enjoyable atmosphere. 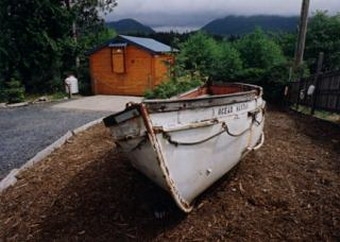 Come and enjoy your stay on the farthest western “Edge” of Vancouver Island. The cabins are cozy and romantic and very private from each other. Queen bed, flat screen TV, DVD, stereo, kitchenette with eating nook, fireplace, barbecue and jacuzzi soaker tub on each cabin's deck. Wireless internet, great view, lots of wildlife. Listen to the sea lions bark, watch the fish boats come and go and marvel at the size of the bald eagles. Firepit on the beach for relaxing evenings outdoors. Single car parking space is included. Multiples night rates are available upon request. November through March 14th –check out our storm watching package –stay 3 nights for the price of 2. This is truly a beautiful and relaxing place to celebrate a special occasion. CHECK IN/OUT POLICIES: Check in time is 3:00 (or later). Please call us that morning at 250-726-8255 (toll-free 866-313-8108) with an approximate arrival time so one of us can be here to greet you. If you will be arriving after dark please advise us and we leave your cabin open and catch up with you the next day. Check out time is noon. PAYMENT: All rates are subject to HST of 12%. A credit card number is required to hold your reservation. We accept Visa, Mastercard, Travellers Cheques or cash; no debit cards or personal cheques. Full payment is due upon arrival. CANCELLATION POLICY: Cancellations affect us significantly because of our small size; last minute cancellations do not give us time to rebook the cabin or suite. Cancellations 14 days or less prior to arrival are subject to a minimum fee of one nights room charge plus tax. Subsequent nights will be refunded only if rebooked by another party. Nights charged may be used toward a future stay. We do not refund for unscheduled early departures. DAMAGE: We reserve the right to charge guests for damage done to the room or equipment during their stay. We have a no-smoking policy in the cabins; if the cabin smells of smoke or is otherwise damaged so it is unrentable we will charge your credit card a one-night fee for extra time and cleaning required. OTHER POLICIES: We are an adult-oriented property, but babies and very small children can be accommodated provided parents bring a bassinette or bedding. There is a minimum 2-night stay year-round, but we can sometimes accommodate a 1-night stay between bookings, so please enquire. Pacific Rim National Park, Long Beach among many other beautiful beaches here. Very rugged and wild -- mostly nature with 2 small communities of 1800 people each: Tofino & Ucluelet. A car is recommended; very little public transportation available. Lots of wildlife -- watch for bears on the road May through October. Laid back, surfing, enjoying nature, some really good restaurants in both towns. Summer for good weather; winter for storm watching! Sept. 16 through June 25: $135 per night. June 26 through Sept. 15: $185 per night. Multiple night rates (for 4 nights or more) are available upon request. Rates include a self-catered breakfast, so we stock the cabin with juice, milk, eggs, muffins, coffee, tea, margarine, peanut butter, jam, hot chocolate, and basic condiments. November through March 14th - check out our Storm Watching Package - stay 3 nights for the price of 2! Upholstered nook in the cabins; pub style table & chairs in the suite. Electric fireplace in each cabin; propane fireplace in the suite. Self catered breakfast supplies included. 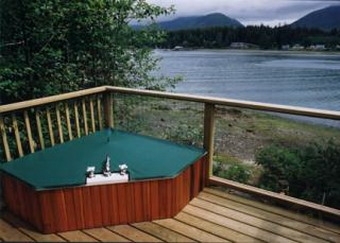 Cabins have 2-person Jacuzzi soaker tubs on their decks; the suite has exclusive use of a 4-person hot tub.